Outermost perimeter is line of demarcation. Crossing the boundary establishes intent - marks an aggressor. It is the first opportunity to provide detection. Defined inner perimeter or open space. Obstruction free or clear zone. Allows detection of aggressors or threats. Traveling across intermediate space is vulnerability for aggressor and provides delay. Depending on level of public access, building exterior may be significant layer of the protective system. It defines the end of site security. The remaining layers are defined within the building as appropriate for the assets within. Barrier is stationary and it is designed to prevent the vehicle from penetrating successfully past barrier. Sometimes incorporated into perimeter barrier / fence. Insure Containment of Unscreened or Suspect Vehicles; only permit access through access points. Can often use topographical features as passive vehicle barriers. Selection Based on Required Operational Performance and Site Conditions. 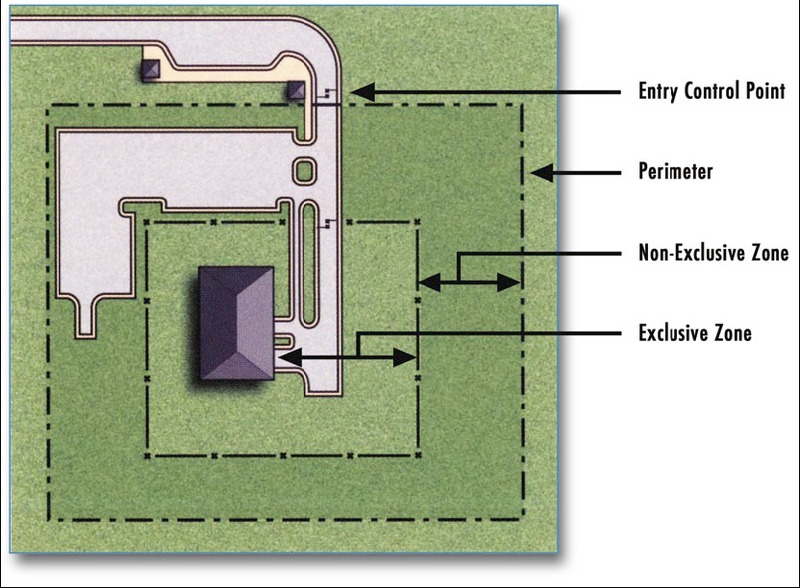 Clear zone can also be provided around the building so that devices are easier to detect. Tactic involves various levels of tools and explosives to attempt to breach the security of the facility.